Throughout year the police department responds to dozens of calls about abandoned bicycles. Each found bicycle’s serial number is checked to determine whether the property had been reported stolen. The police department must hold the abandoned property for a designated period of time. The police property room is commonly overflowing with unclaimed bicycles. With no known owners, the bikes must eventually be discarded. The Bike Commuter, a Sellwood neighborhood bike shop, generously volunteered to refurbish some of the unclaimed bikes, making sure all the tires, brakes, and steering were in working order. 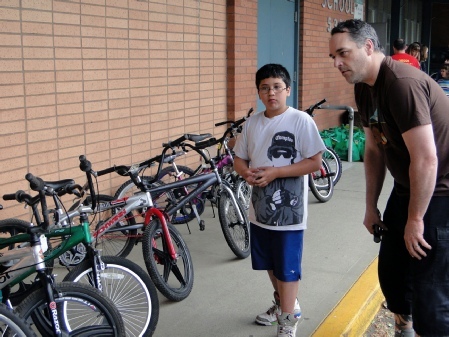 In 2011 Milwaukie Police Chief Bob Jordan then asked the principal of Seth Lewelling Elementary School to help find children that didn’t have, but wanted a bicycle. The Milwaukie Public Safety Advisory Committee also helped with this new project. Eight children were selected, and able to choose from a selection of twenty bikes. In 2012 it was decided to expand the project to other Milwaukie Elementary Schools and the Middle School. However as the number of unclaimed bikes was well down on the previous year, we decided to augment the number we had by buying new bikes. Walmart kindly allowed us to buy new bikes at cost price, enabling us to give each school 5 bikes each year through 2014. In 2015 we decided the cost of repairing and refurbishing used bikes plus the extra work to do so made it advantageous to buy all new bikes. 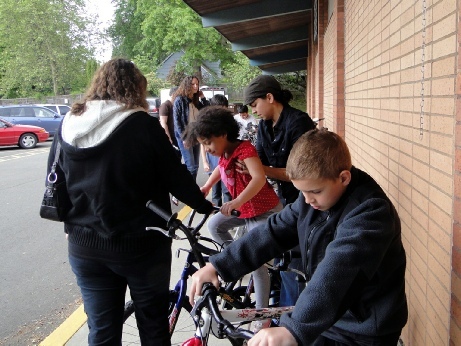 MPSF raises funds to enable the Milwaukie Police Department to continue to give 5 bikes each to Ardenwald, Linwood, Milwaukie and Seth Lewelling Elementary schools, plus Rowe Middle school. In 2017 the program is in its seventh year, but due to the venue where we held our fund raising dinners now wishing to charge us, the continuation of the bike program cannot be guaranteed. Any help you can give in the way of donations will be really appreciated by the kids. Thanks so very much.